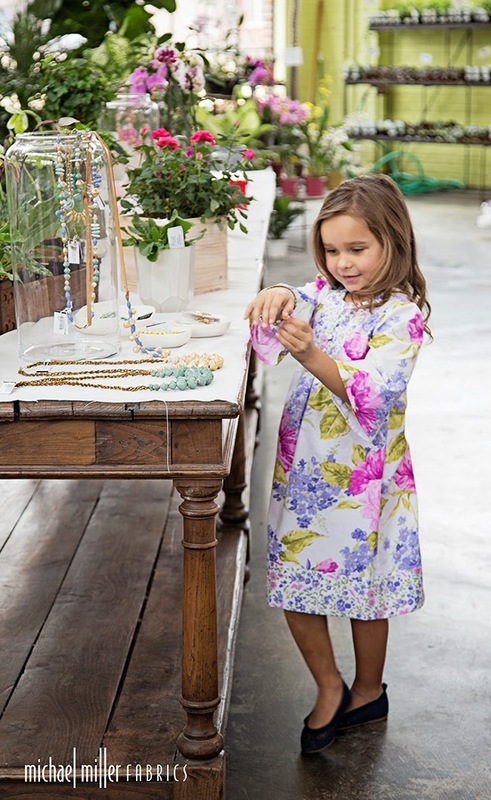 making it fun: French Flowers, Veranda and a Giveaway!! 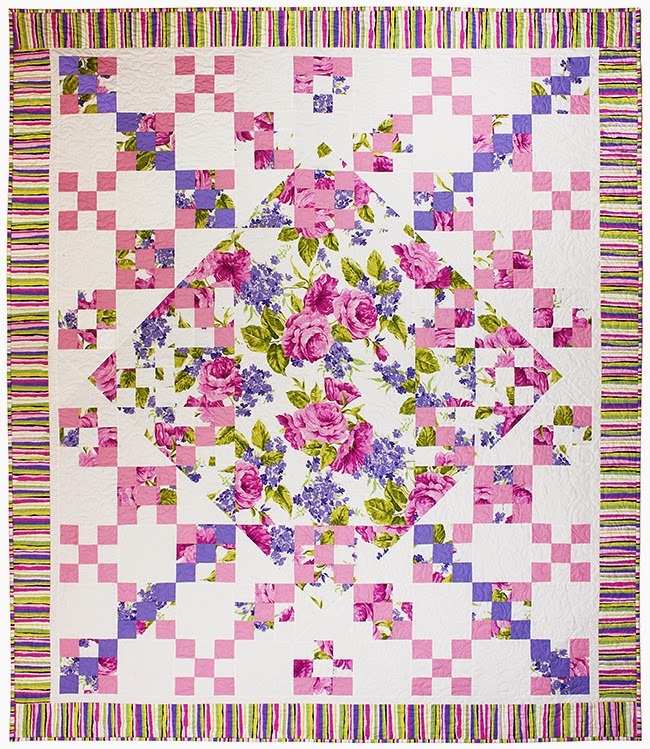 Susan Emory of Swirly Girls Design created the romantic quilt below. For the free pattern, please visit our website. Seeing all of these beautiful floral designs sent me on a Pinterest spiral into lovely flowers... below are some of my favorites! 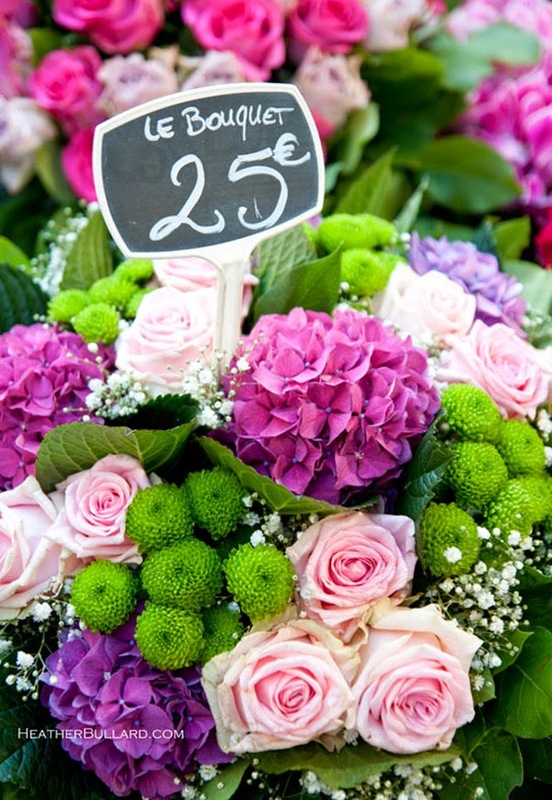 It seems I'm into wild arrangements and French Market flowers! What's your favorite flower? Comment and let me know ~ you'll be entered to win a bundle of Veranda! And the winner is, KathleenD!!! She said, "My favorite flowers are tulips. This new fabric line is beautiful!" Veranda starts shipping to stores on April 15th. i love roses the most. My favorite flowers are sweet peas. Beautiful collection and inspirational photos! My favorite flowers are lilies and hibiscus. I love all flowers but Blue Morning Glories are my favorite! The Old English Roses...the ones that still smell like roses. Happy Spring to you! My favorite flower is the 'Sweet Pea'! Thank You for sharing! I'm a fan of Hydrangeas; but baby rose buds are precious. Thank you. I love all flowers but, Sunflowers would be my favorite. Love the pictures. All the projects look great. Thank you for the chance. Pretty peonies are my favorite! Gorgeous fabrics. I love wisteria and stephanotis. The singular beauty and fragrance of the white magnolia--love. I love hydrangeas and tulips but orchids are great too. Roses are my favourite followed closely by hydrangeas ! My favorite flowers are Tulips. I love this new fabric line! Veranda is beautiful and totally Spring-like! I will have to get some!!! I love the smell of camellias, but the look of hydrangea, tulip, and peonies. And I'd love to win this fabric. Thanks. Two favorites: lily of the valley, because my dear dad used to climb the little hill near our house and pick them for me, and tulips, because they are so happy. What beautiful fabric! My favorite flower is a purple iris. Thanks for the fun! Two favorites: lily of the valley because my dad used to climb the little hill near my house to pick them for me, and tulips, because they are so happy. I love peonies, I wish they were in season longer. I love hydrangeas and lilacs. 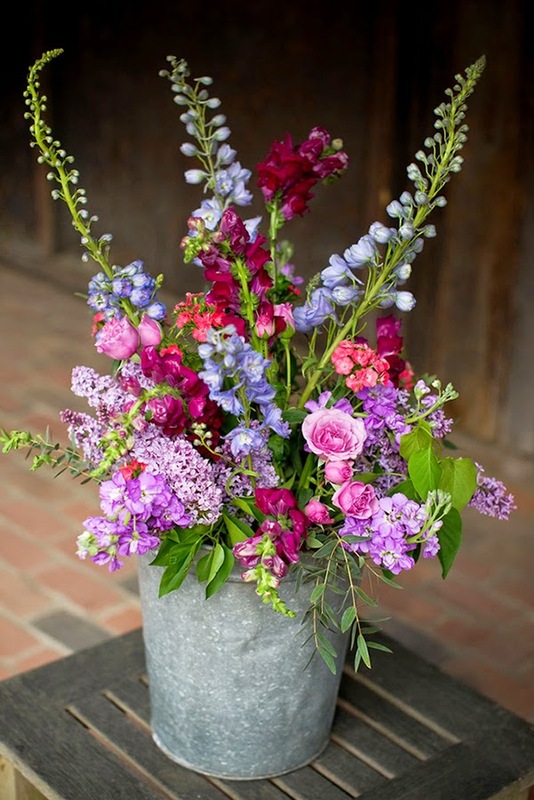 The colors of the hydrangeas and the fragrance of the lilacs are both gorgeous! Beautiful fabrics! The yellow Rose is my favorite. My favorite flower is the daffodil. It's one of the first spring blooms and is so delicate and fragile. It comes in a variety of colors too, but is mostly a reminder that warm weather is on the way! My favorite Spring flower is Tulips, Summer is Sunflowers. Inside it's Orchids and Christmas Cactus. Right now my orchids are blooming everywhere. 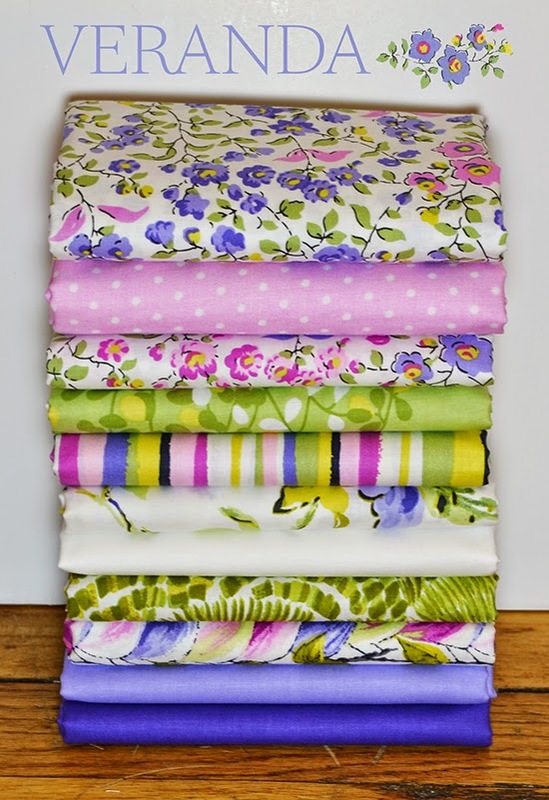 This fabric bundle is beautiful! My favourite flowers are petunias. Thanks! I like lily of the valleys the most and tulips second. The spring flowers are always so welcome after a cold bleak winter, and the one standout I have always loved is the daffodil with its happy color and lovely scent, but then I love all flowers as they wax and wane through the seasons. The daffodils blooming across the road from the Pentagon after 9/11 brought those of us who were there us so much hope and promise in the year following the tragedy. These Fabrics & pictures are GORGEOUS!!! Hydrangeas. I love them on so many levels. Definitely hydrangeas. Unfortunately theyndont grow in the high desert of Southern Utah. But still my favorite! Full blown roses - the fuller the better. My favorite garden plant is lamium. It has purple, pink or white flowers that appear from early spring until late fall, lovely colored leaves, and is a cheerful thing, growing in pots, as a ground cover, in shady or sunny spots. It's not a show stopper, but more like a faithful old friend, always there when you need a little color! HELLO, LOVELY SPRING FLOWER COLLECTION>THANK YOU FOR SHARING! LOVE THE ROSES BEST! Lilacs are my favorite flower. What lovely and fresh fabric. Happy Spring! I'm a fan of daffodils. I love roses! Thanks for the chance to win! My favorite are lilies. I love all varieties! Pansies or maybe tulips. No! Wait, zinnias! Oh, I can't decide. I like all flowers, even dandelions. I love lots of flowers, especially daylilies and daisies. Tulips! I grew up with my mother planting tulips in the front yard, and they always came back every spring. what lovely photos. Its the perfect time of year for because I love tulips. Beautiful photos!! I love flowers and I am so lucky that my husband surprises me with bouquets often!! My favorite garden flower is the Sweet Pea... they are delicate and pretty and smell heavenly!! Poppies for me :) But have a weakness for tulips and daffodils this time of year! Thank you for the giveaway. My favorite flower is a yellow rose. Love roses and all other flowers! So many! Daffodils and roses among many others. Without question, it is the peony! What a beautiful group of fabrics! Pansies are the first to arrive and the last to leave! I am a sucker for carnations! Love this fabric & the creative ideas! This is gorgeous! I love tulips and calla lilies. 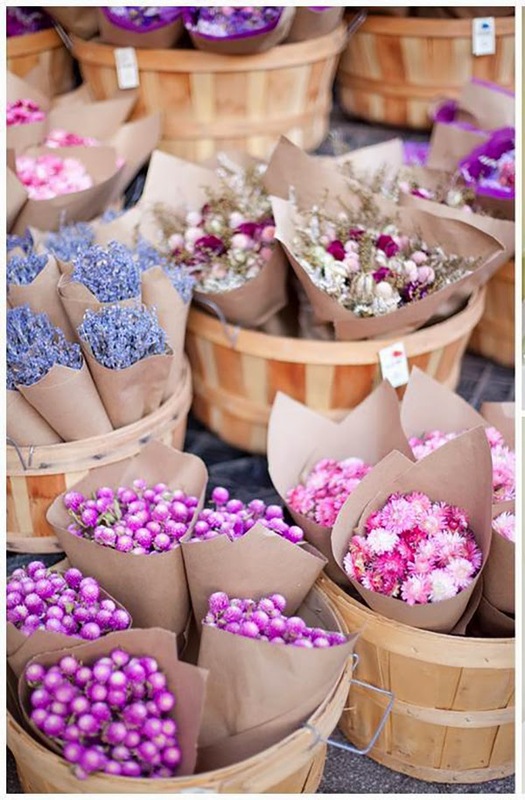 I love all flowers but lavender the most! I love lillies and hydrangeas. This collection is beautiful. Thanks for the chance to win! My favorite is the purple iris. It grows wild in and around our village in June and is a welcomed sight after a cold winter. I love tulips and roses. I love roses the best. I love the smell, the colors, the petals, etc. I have roses planted outside my bedroom window, and the smell of the roses coming through the window on a warm, sunny morning...... Ahhhhhhhhhhhhh. It really is hard to pick just one! But I'd have to go with TULIPS! This collections is so dreamy! I love everything purple and lavender! You guys did great! Red poppies! They beautify ugly landscapes! Such beautiful fabric, hope it win! My favorite flower is a rose, of any color. Oh, I am loving the carnations and the daisies. Those were our wedding flowers 36 yrs ago! I am a florist's daughter, so this is a hard choice. When made to pick one, it would be blue hydrangeas. Love violets. Sign of spring. Yikes..I have more than a few favorites (some were mentioned in other comments), but I'll name one of mine, that I didn't see as I was skimming through. I love cosmos. I also love this fabric line and would be thrilled to win. Thank you for the opportunity. My mother's favorite flowers were gladiolas and they are mine, too. 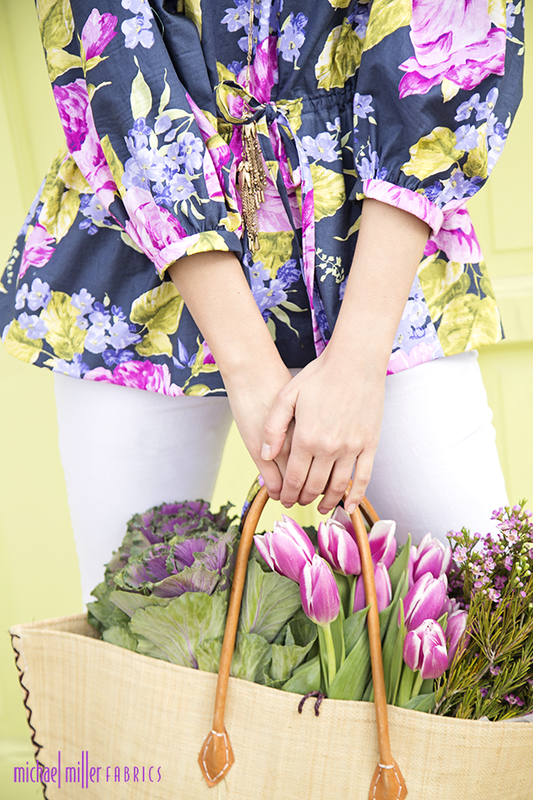 This fabric just shouts the joy of spring and I'd love to win it. Thanks for the chance. My favorite flowers are tulips. This new fabric line is beautiful! I love tea roses! thanks! I love iris - have lots planted in my yard. I love gerbera daisies. I love all the bright colors! Delphiniums are my most favourite flower. Lily of the Valley are so delicate and smell so good. Beautiful fabrics!! I love almost all flowers, but I guess my very favorite are roses. Love the purple and pink , spring flower colors suitable for a lady who loves purple and pink tulips. Love Gardenias! They were my Mother's favorite. Remind me of her. I love the hydrangeas and the roses. The fabrics are beautiful!